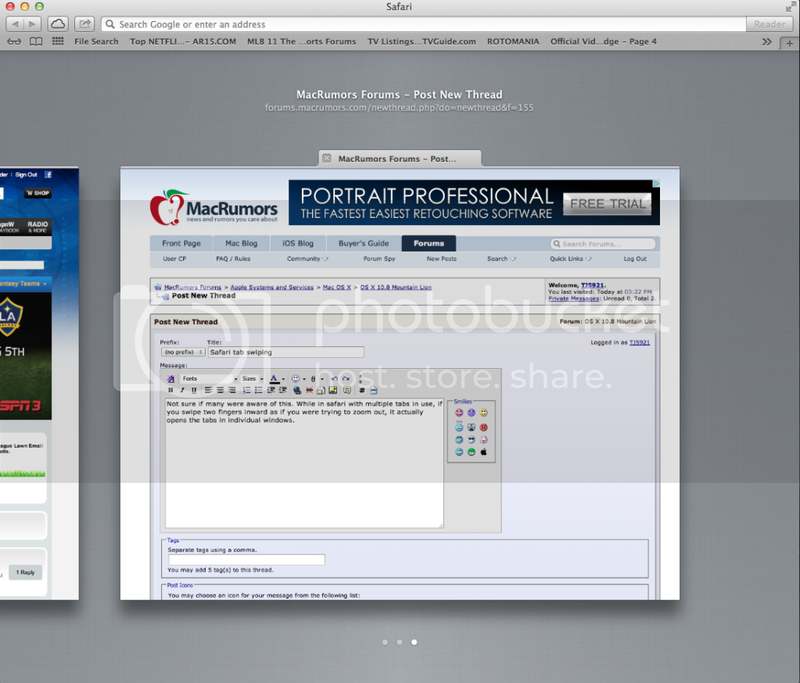 Discussion in 'OS X Mountain Lion (10.8)' started by TJ5921, Jul 26, 2012. Not sure if many were aware of this. While in safari with multiple tabs in use, if you swipe two fingers inward as if you were trying to zoom out, it actually opens the tabs in individual windows. Most people know about this already, this was shown off at WWDC, over a month ago. Yes that is a highlighted feature. Unfortunately I think they missed it a bit on that one. I typically have 2-4 safari windows upon with anywhere from a single tab to 15 tabs per. Gridding the tabs Top Sites style would be better than a long left to right snake. There is an extension for safari called Exposer or Tab Exposer but the download has been broken for some time and when I did have it on an old machine, it was somewhat laggy. would you say your safari lags/slows down after having 15 tabs open? just wondering i never had so many open at the same time. My iMac had 12GB of RAM and my Air has 8. However I do still have to manage memory b/c iTunes (always running for Apple TV streaming access) and Safari (at least 5.x) are both RAM hogs. Apparently 6 manages RAM much better. I typically close all tabs, and quit iTunes and Safari on the iMac once or twice a week to reset usage, but I wouldn't call Safari laggy. I don't have Exposer on either machine b/c I couldn't DL it.